How does Melanoboost Peptide Sun Tanning Work? Melanoboost® uses intelligent technologies designed to trigger an increase in melanin production without exposure to UV light. Melanin is the pigment which makes our skin turn brown. The more abundant our melanin levels, the darker we are able to tan. When used in conjunction with minimal sun exposure, the tanning result is significantly amplified, resulting in an intense, long lasting tan. Does Melanoboost Peptide Sun Tanning Oil contain fake tan? Our Peptide Sun Tanning Oil contains only our active Peptide Complex which is designed to boost melanin levels and product a faster, darker sun tan. Our second product, Peptide Sun Tanning Oil + Bronzing contains a hint of sunless colour to give you an extra boost of skin tint before you work on your real sun tan. Great for really pale skin! Does Melanoboost work on fair skin? Yes, Melanoboost will work on all skin types. As everyone tans differently, results will differ from person to person. It will depend on your natural skin tone and natural sun tanning ability. Some people have seen results when using it with sun exposure in as quickly as 20 minutes; others who are fairer and have less melanin to begin with, may notice a slower increase. Is Melanoboost water resisitant and contain sunscreen? Your Melanoboost will absorb into your skin once you apply it, but if you are swimming or sweating excessively you will need to reapply it. Remember that you only need a small amount of our oils for them to be effective. Our product range doesn't contain sunscreen. Melanoboost recommends being sun smart. It is important to always wear a sunscreen, protective clothing and avoid extended periods in the sun, to protect your precious skin from damage. Apply your sunscreen over your Melanoboost. Can I apply Melanoboost to my face and is it Vegan? Yes, Melanoboost Peptide Sun Tanning Oil can most definitely be used on the face. The oil is nourishing with a variety of antioxidant benefits, as well as many others. We spent time perfecting the consistency so it absorbs beautifully into the skin and doesn’t leave you feeling slimy! It won’t clog your skin and it smells delicious. You can still apply your daily SPF on top for sun protection of the oil and it won’t hinder the tan you get. We are happy to say our products are Vegan. Will using sunscreen on top hinder my ability to tan? It won't reduce your tanning ability, it will in fact help your tan. Protecting the skin from burning, peeling and sun damage, sunscreen is vital when spending time outdoors. We highly recommend the use of sunscreen and sun protection conjunction with all Melanoboost products. Is Melanboost safe during pregnancy and/or breast feeding? The Melanoboost range consists of topically applied products that works in the areas it is applied. The Peptide Complex is not systemic, meaning it won't enter the bloodstream. So it is fine during pregnancy and breastfeeding. As with all skin care products, during breastfeeding apply outside areas that would come in contact with a babies mouth. It is important for us to note that all women and pregnancies are different and it is advised that you check with your individual doctor if you're unsure. The base of our oils are made up a gorgeous skin conditioning ingredients that will feed your skin. Be sure to use our products in conjunction with sun protection. This will differ from person to person. It will depend on your natural skin tone and natural sun tanning ability. Some people have seen results when using it WITH sun exposure in as quickly as 20 minutes; others who are fairer and have less melanin to begin with, may notice a slower increase. Will it make my moles, freckles and pigmentation darker? 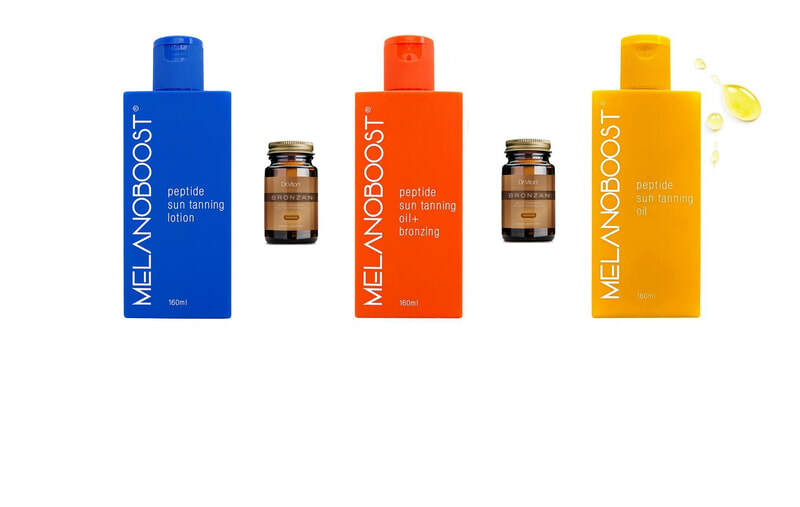 Using Melanoboost will affect your moles, freckles and pigmentation the same way the sun would. It will make them more evident as the melanin content increase also in freckles, moles and dark spots. Melanoboost recommends that you take a balanced approach to sun exposure to maximise benefit and minimise risk, and always wear sunblock. Will my Melanoboost tan fade like a real tan? Yes, it will fade like a real tan because it IS a real tan! If you continue to use it on a daily basis (even indoors) it will continue working on your tan without the need for UV exposure so therefore you can potentially keep a level of tan all year round. How long does a Melanboost tan last? This will be dependent on a few things: your natural tanning ability, how long your real tan usually lasts, and how well you care for and maintain the health of your skin. 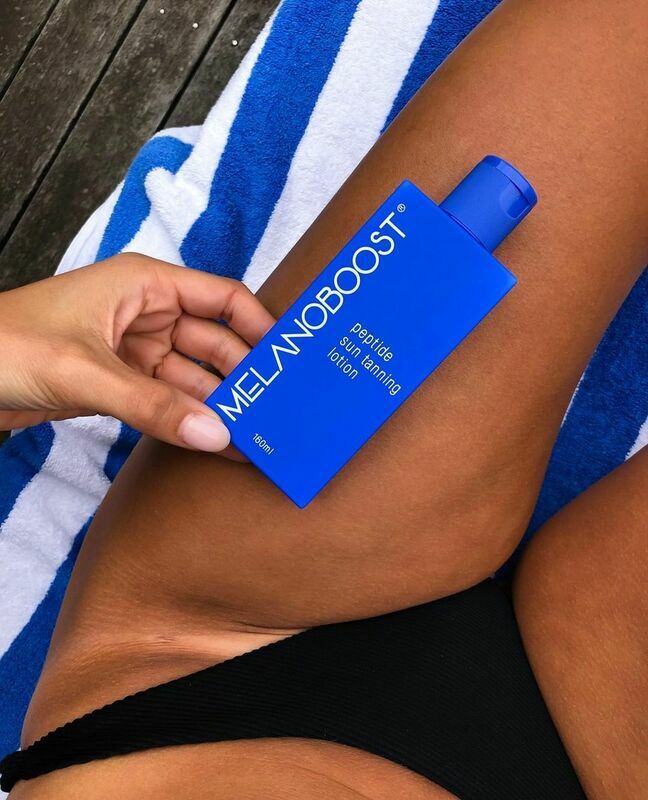 Melanoboost will definitely help to lengthen the life of your real tan because the peptide will continue to stimulate your melanin production each time you apply it (even indoors). Also, our 8 skin food oils have been specially selected to deliver nutrients, antioxidants and extreme moisture into your skin. This will significantly increase the health of your skin, maintaining your tan further. Lastly, always wear sunblock. It will help to reduce / prevent sun damage and peeling. Peeling skin is unhealthy skin and will mean your real tan disappears more quickly. Can I use Melanoboost with Bronzan Accelerating Tanning Capsules? Yes most definitely. Bronzan works from in inside out while Melanoboost works from the outside in!